Hogugy symbolizes the "Hoguk Jungshin (patriotism)" and the nation's holy animal, tiger. It also symbolizes the Korean peninsula and the spirit of the "Baekdusan(Mt. Baekdu) Tiger" roaring towards the world. 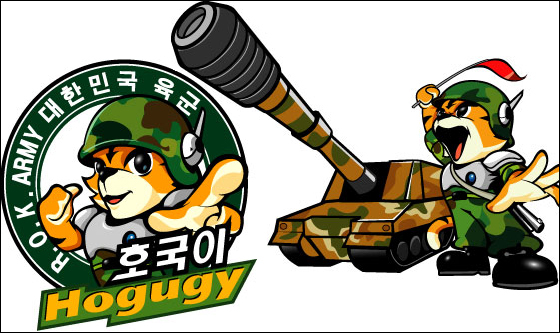 Hogugy's gesture expresses the future-oriented ROK Army and symbolizes the beloved Army from its people. I suspect they lifted that from someone whose English is not so good. Anyone interested can buy Hogugy Club gear here.